alongside, victoria's own Degree One. 19+ w/ 2 Pieces of ID. Also brought to you by: WESC, Dose.ca, Adidas, Mole, Complex & Red Bull. 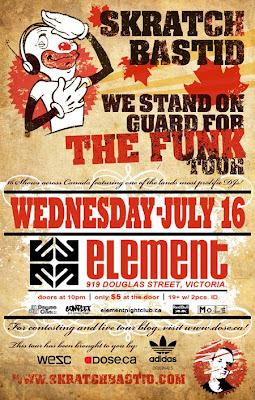 Skratch Bastid, on his We Stand On Guard For The Funk tour hits Element on Wed July 16, 2008. If you were here for his January show, you know how crazy a party rocker he really is, no matter what music you’re into. If you haven't seen him live then know he's a DMC & Scribble Jam Champion, Juno award nominated producer and can rock any type of party, anytime, anywhere! No advance tickets for this one, just $5 at the door so come early and get things started with Victoria’s own Degree One. Search Skratch Bastid on youtube and I’ll say no more ! !